"Sonic the Hedgehog FCBD 2007"
Sonic the Hedgehog FCBD 2007 issue is Sonic's first FCBD issue. This issue has only one story Unburying the Hatchet. Continued from issue 173 (probably). The story begins with Sonic captured by Metal Sonic (off panel) and Eggman gloating, Sonic insults Eggman saying Metal captured him and Eggman a bit disappointed tells Sonic if he disproves being a robot he'll "use the real thing instead." It cuts to the freedom fighters where sally's making a plan to rescue Sonic when Sonic arrives. Thinking he's normal Bunnie greats him when suddenly Sonic strikes her and the rest of the freedom fighters and telling them his next target is King acorn's castle while winking. The Chaotix arrive trying to fight Sonic off but they don't last long when out of nowhere Knuckles hits him and Sonic tells him of the control device in his ear and wants knuckles to restrain him until Tails or Rotor arrives but Knuckles thinks a beating will be the solution and the fight continues. Meanwhile Snively tells Eggman that his plan is stupid (and i aggre) but Eggman say's it's the controls fault where Snively see's Metal and he tries to reprogram it but it reveals Eggman's keeping a close eye on him and tells him to scrap all his plans while he and Metal leave to join the fight keeping the setting on auto-brawl. It cuts back to Sonic & Knuckles fighting into the castle where it looks like Knuckles is gonna lose where out of nowhere Tails hits him allowing Knuckles to punch Sonic breaking the control device. Eggman enters the castle with Metal and tells him to fight thinking they're to exhausted to fight but they quickly show him they're not tired and instantly destroy Metal. Eggman tries to take this as his chance before he realises he's surrounded and so he leaves. The story ends with Eggman telling Snively to ready the Egg Fleet and a shot of things to come. This is Sonic's first FCBD issue. When writing this book Ian Flynn was probably influenced by Sonic the Hedgehog issue 39 and Mecha Madness as Bunnie was the first one to get attacked and Knuckles was the one who had to stop him. The same scene shows him holding a genesis controler with the buttons on the wrong sides. It's believed this takes place between issue 173 and issue 174 as Espio is kidnapped in 174 but is here. The final shot at the end is a prelude to an upcoming milestone. 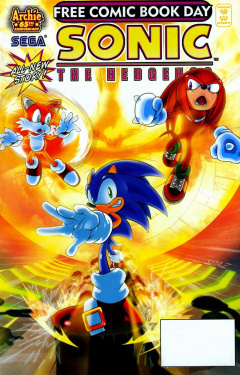 The issue was reprinted in issue 7 of the Sonic Super Special Magazine and Sonic Select issue 7. This page was last edited on 17 October 2018, at 06:41.